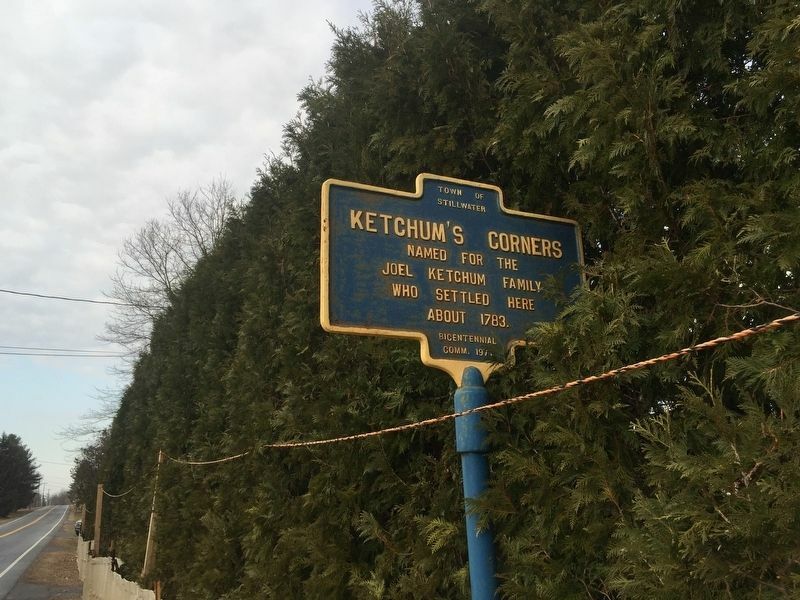 Named for the Joel Ketchum family who settled here about 1783. Erected 1977 by Town of Stillwater Bicenntenial Comm. Location. 43° 0.682′ N, 73° 41.655′ W. Marker is in Stillwater, New York, in Saratoga County. Marker is on County Route 70 when traveling south. Touch for map. Marker is in this post office area: Stillwater NY 12170, United States of America. Touch for directions. Other nearby markers. At least 8 other markers are within 3 miles of this marker, measured as the crow flies. Saratoga Springs Air Force Station (about 700 feet away, measured in a direct line); The First Baptist Church (approx. 1.9 miles away); To the Battlefield (approx. 2.3 miles away); George O. Slingerland (approx. 2.3 miles away); 225th Anniversary Battles of Saratoga (approx. 2.3 miles away); Brigadier General Simon Fraser (approx. 2.3 miles away); Unknown Soldiers (approx. 2.3 miles away); New York and Massachusetts Forces (approx. 2.4 miles away). Touch for a list and map of all markers in Stillwater. More. 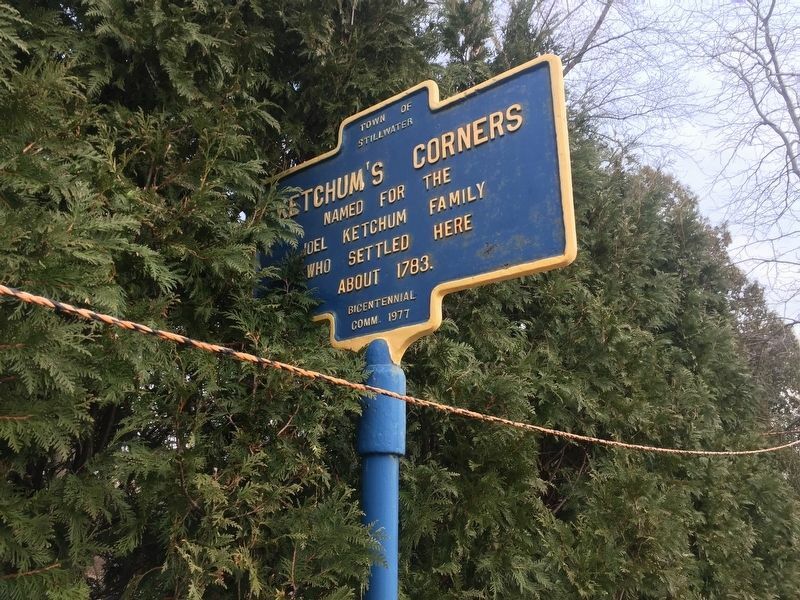 Search the internet for Ketchum’s Corners. Credits. This page was last revised on March 30, 2019. This page originally submitted on March 29, 2019, by Steve Stoessel of Niskayuna, New York. This page has been viewed 73 times since then. 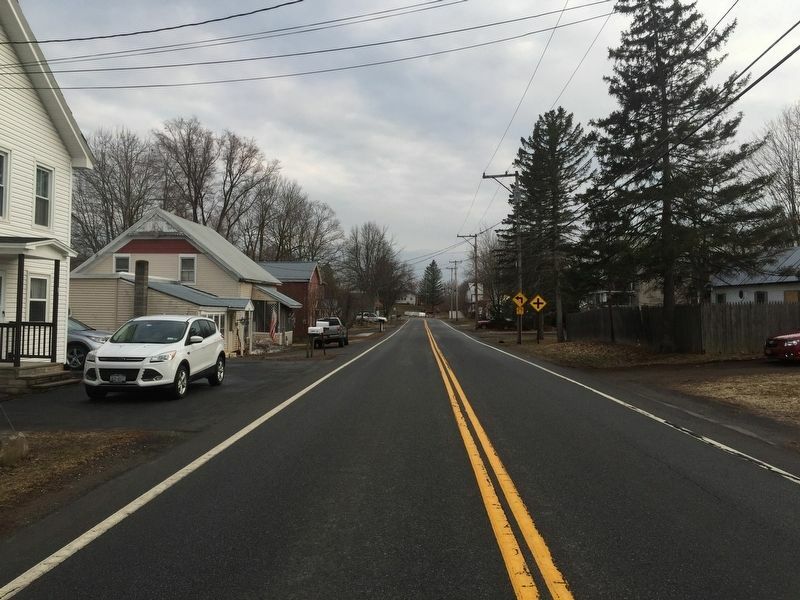 Photos: 1, 2, 3. submitted on March 29, 2019, by Steve Stoessel of Niskayuna, New York. • Andrew Ruppenstein was the editor who published this page.